Last Updated: 9/13/2012 | File Size: 12351 KB | Price: $9.95 | Downloads: 686 | Developer: Add-in Express Ltd. If you need a tool for quick and convenient contact management in Microsoft Outlook 2007 and 2010 - this is the one for you. Smart Contacts shows a list of your recently and frequently used contacts on a pane that is always available when you work in Outlook. Any new email address you reply to is automatically added to Recent contacts and to have your own list you can mark email addresses as favorites. This little plugin offers incremental search to find any recipient in seconds. You can enter any contact details or parts and find them by domain or company name. Besides, you see the email addresses you use more often at the top, so no need to scroll through all contacts in your address book. Contact cards show all email addresses and details you need, let you call or email the person, edit or delete the information in the Outlook address book. You can also remove the contact from the list on the pane for good, or return it back via search. You'll forget about Outlook Auto Complete with a click on a contact to add it as To, CC or BCC recipient and always see the entered email addresses marked on the pane. Statement: First, please download the orginal installation package by clicking the download link. Of course you may also download it from the publisher's website. Using Ablebits.com Smart Contacts for Outlook crack, key, patch, serial number, registration code, keygen is illegal. The download file hosted at publisher website. We do not provide any download link points to Rapidshare, Hotfile, Depositfiles, Mediafire, Filefactory, etc. or obtained from file sharing programs such as Limewire, Kazaa, Imesh, Ares, BearShare, BitTorrent, WinMX etc. Software piracy is theft. 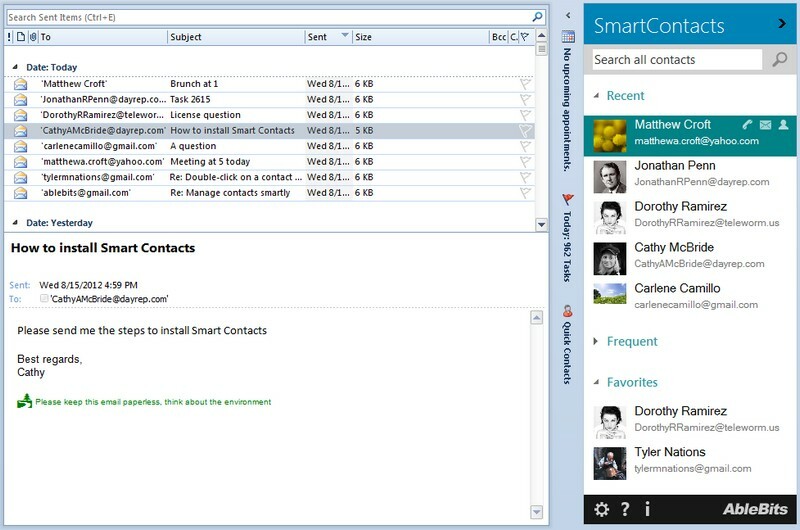 If you like Ablebits.com Smart Contacts for Outlook please buy it.